CHICAGO – The Association of College and Research Libraries (ACRL) announces the publication of “Motivating Students on a Time Budget: Pedagogical Frames and Lesson Plans for In-Person and Online Information Literacy Instruction,” edited by Sarah Steiner and Miriam Rigby, a collection of lesson plans, activities, and techniques that utilize motivational strategies and pedagogies to help keep students engaged. As librarians, we often find ourselves outside the traditional structure of our education system. Time limits add another layer of complexity; how can we motivate students to learn when we only see them for an hour or two? 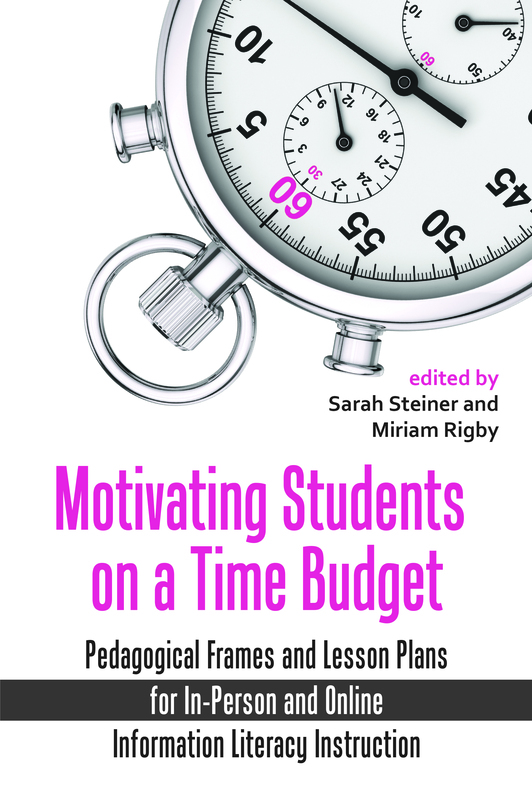 "Motivating Students on a Time Budget" begins with a section of research-based, broad-level considerations of student motivation as it relates to short-term information literacy instruction, both in person and online. It then moves into activities and lesson plans that highlight specific motivational strategies and pedagogies: Each encourages the spirit of play, autonomy, and active learning in a grade-free environment. Activities and plans cover everything from game-based learning to escape rooms to role playing to poetry, and are thoroughly explained to be easily incorporated at your campus. While librarians have made great strides in integrating information literacy into long-term curricula, many of us have only one class session to make a difference. Consideration of human motivational strategies can have a profound effect on our attitude toward and approach to learners and, ultimately, on their levels of engagement, satisfaction, and success. The techniques outlined in Motivating Students on a Time Budget can help you feel empowered to use motivation research to meet your students where they are intellectually and emotionally, and empower and inspire them to cross conceptual thresholds critical to information interpretation and use. “Motivating Students on a Time Budget: Pedagogical Frames and Lesson Plans for In-Person and Online Information Literacy Instruction” is available for purchase in print and as an ebook through the ALA Online Store; in print through Amazon.com; and by telephone order at (866) 746-7252 in the U.S. or (770) 442-8633 for international customers.